New York's Department of Parks has announced that next year Dean J. Poll, who currently holds the license to operate the Boathouse in Central Park, will also take over the management of Tavern on the Green. 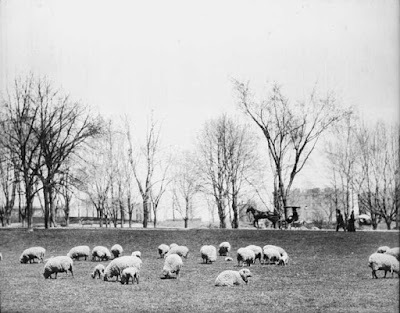 The Green came to be nicknamed Sheep Meadow because from 1864 to 1934 it housed a flock of pedigree Southdown and Dorset sheep. The removal of the sheep in 1934 is a story we tell in Inside the Apple. There are many plausible reasons why the sheep may have left, but certainly the main one is that the Parks Department (in the person of Robert Moses) had its eye on their sheepfold, an elaborate 1870 structure designed by Jacob Wrey Mould. As soon as the sheep were out, their barn was tranformed into Tavern on the Green. The Ridley building as it appeared in 1874; it was expanded in 1886, badly damaged in a fire in 1905 after the store had been sold, and truncated in 1931-32. 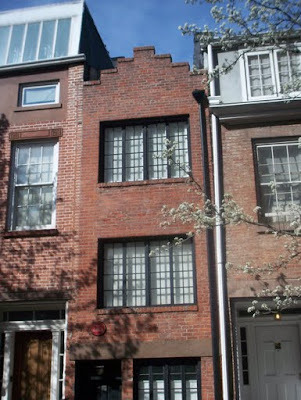 As guest blogger Bowery Boogie noted on Curbed yesterday, the pink Jodamo building on the Lower East Side at the corner of Orchard and Grand streets is for sale for a cool $25 million. 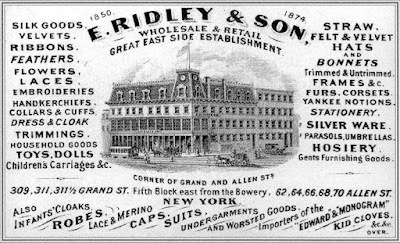 In the nineteenth century, the building was home to E. Ridley and Sons, one of the biggest department stores on the Lower East Side. Though Broadway in the area we today call SoHo was home to most of the city’s high-end shops, including A.T. Stewart’s “Marble Palace,” the stretch of Grand Street east of Broadway was an important retail district in its own right. Many of the shoppers came from Brooklyn or New Jersey on the Grand Street ferry and were then transported by horse-drawn street car. Edward Ridley died in 1883 and the store was taken over by his sons, Edward A. and Arthur Ridley. 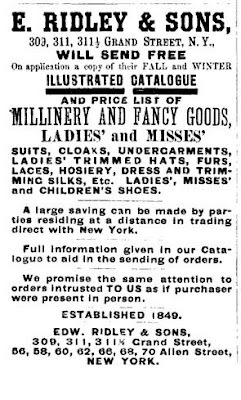 They continued in business until 1901, by which time they could no longer attract a enough clientele to fill the store. The building was sold and subdivided and both brothers went into real estate. Now, here’s where the story gets weird. Ridley needed to wear rubber overshoes in his dank, cellar office and ultimately took to wearing them at all times. He allowed his beard to grow out, making him look like a wild-eyed Biblical prophet (“Whitmanesque” the Times called it), and he was rarely seen outside the office except going to and from his boarding house in New Jersey, always carrying an umbrella, rain or shine. Then, in 1931, Ridley showed up for work one day to find his assistant, Herman Moench, dead. Actually, Ridley read his mail for about an hour, then bothered to go to the other side of the 8x15 foot office and found Moench lying next to his desk. At first the police assumed that Moench, who had worked for Ridley for an astonishing 51 years (he’d started at the store when he was 9 years old) had died of natural causes. 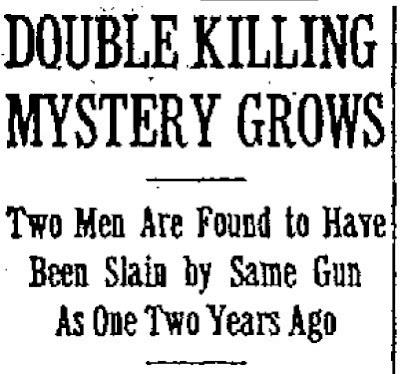 Only when the body was examined by the coroner were two bullet wounds discovered. No one who worked at the garage that surrounded the office, including its managers, Harry and Lee Weinstein (who leased the space from Ridley) had seen or heard anything and with no leads, the case soon went cold. Just a little over two years later, tragedy struck again. Ridley had hired Lee Weinstein from the garage to be his new assistant. On May 10, Lee’s brother Harry was unable to reach them in the office by telephone; he asked a garage employee to check on his brother and the man discovered that Lee Weinstein had been shot twice and Ridley beaten to death. The similarity of the two cases led the police to reopen the Herman Moench murder and ballistics tests immediately proved that the same gun had been used to kill both of Ridley’s assistants. At first, the police assumed Ridley had been killed trying to protect Weinstein. However, when the old man’s will was found, it showed a $200,000 bequest to Weinstein, making the police wonder if Ridley had been the intended target and if Weinstein had been involved in both murders. The next day, the police discovered that Weinstein had been secretly married and living with his wife under an assumed name at a midtown hotel. 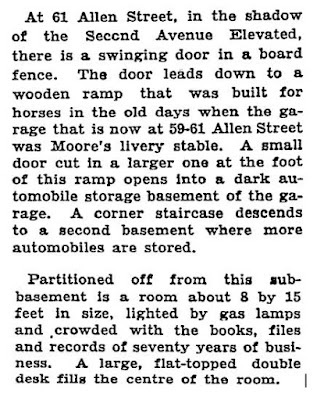 As the investigation continued, the police found an unused bootlegging room in the Allen Street garage where Ridley kept his office, but decided that illegal alcohol had nothing to do with the murders. More promising was the discovery that Lee Weinstein had purchased a $2,050 car—while only making about $40 a week. It soon became clear that the will was a fake, signed by Ridley unwittingly and “witnessed” by two fellow conspirators—both of them accountants who helped keep Ridley’s books—who had hoped to split the $200,000. Further investigation revealed that Weinstein and his accomplices had already stolen over $200,000 from his employer. But this discovery did little to shed the light on the killings and Weinstein's fellow thieves seemed to have nothing to do with the murders (and no connection to Herman Moench). The accountants were indicted for the theft and forgery but despite a $10,000 reward, no useful information came to the police. Ridley had owned many tenements on the Lower East Side and was said to be a miserly landlord, but none of his tenants was ever seriously looked at for the murders. To this day, the case remains one of the great unsolved crimes of the Lower East Side. The building at 59-63 Allen Street still stands – and is still a parking garage. Does Ridley’s obscure basement office still exist, as well? If you park in the building, check it out and let us know! 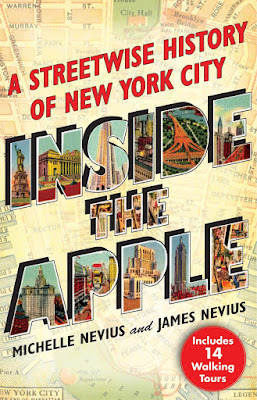 Our book, Inside the Apple: A Streetwise History of New York City, has a great walking tour of this neighborhood. And while it doesn’t stop at Ridley’s, it does take you to a number of famous places on the Lower East Side, ending just a couple of blocks from the Ridley’s intersection. The book is available from retailers across the country or online. 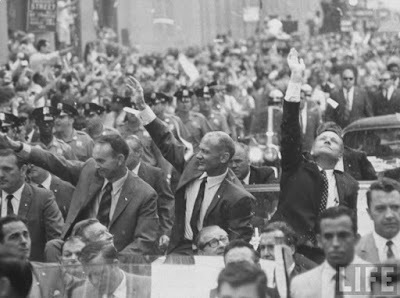 For more on the origin of the ticker tape parade and a walking tour of the “Canyon of Heroes,” check out Inside the Apple. 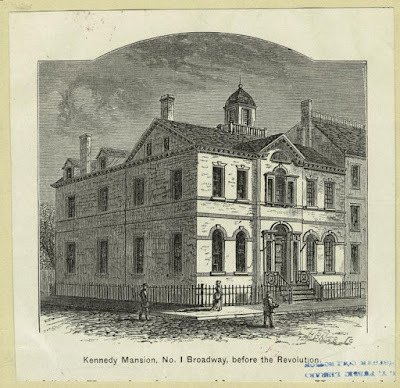 Or join us this Sunday for our free tour of that neighborhood, during which we’ll focus on the American Revolution. EV Grieve just alerted us to the fact that sculptor Tony Rosenthal passed away last week at the age of 94. Rosenthal is best known as the artist behind the rotating Astor Place Cube (officially, The Alamo -- so called because his wife thought it was a good name for an impenatrable object). SteelPark at 401 East 80th Street. Also, according to the artist's website, a temporary exhibition is currently on view in the Ralph Lauren flagship store at 72nd Street and Madison. Another interesting note: the Astor Place Alamo -- which was originally installed temporarily as part of a citywide "Sculpture in Environment" show -- is not one of a kind. 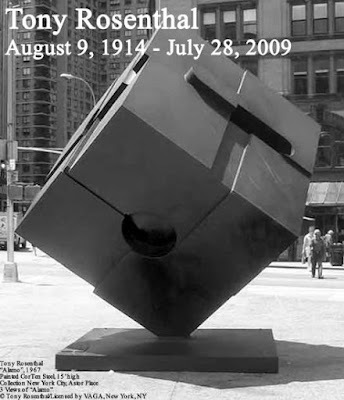 Examples of Rosenthal's cube sculptures can be found in private and public collections, including Pyramid Hill Sculpture Park in Hamilton, Ohio, and at his alma mater, the University of Michigan, at Ann Arbor (where the piece is called Endover). You can also read Tony Rosenthal's obituary in the New York Times.